This peanut butter sauce is super easy to make with just four ingredients and a short time on the stove. It is a fantastic warm topping when drizzled over ice cream, pound cake, cheesecake, or bread pudding. You can even serve it with pancakes or biscuits for a decadent twist on an everyday breakfast. By swirling this peanut butter sauce into store-bought or homemade vanilla ice cream, you can turn ordinary into extraordinary. And a little spread on a brownie will make any chocolate and peanut butter fan jump with joy. The corn syrup in this recipe helps to create a smooth sauce, preventing the sugar to crystallize, and adds moisture and sweetness to the sauce as well. You can substitute dark corn syrup for the light; however, the more robust flavor of the dark corn syrup—versus the delicate sweetness of the light corn syrup—will affect the final taste of the sauce. Combine all ingredients in a small saucepan. Heat over low heat, stirring, until smooth and the ingredients are well incorporated - about 4 minutes. Continue to cook, stirring constantly, until the sugar is dissolved and the sauce is smooth. Do not overcook or the sauce will become too thick. Add a bit of water if it is too thick. Remove from the heat and cool slightly before serving. Serve over ice cream, pound cake, cheesecake, or your favorite dessert and enjoy. The peanut butter sauce will last up to two weeks covered well in the refrigerator. Before serving, warm over low heat, adding a tablespoon or so of heavy whipping cream to thin if necessary. Dessert sauces may not be the first thing you think of when you are serving a sweet to end the meal. But a warm sauce drizzled over a piece of cake (even store-bought) can become an impressive dessert, worthy of presenting at your next dinner party. 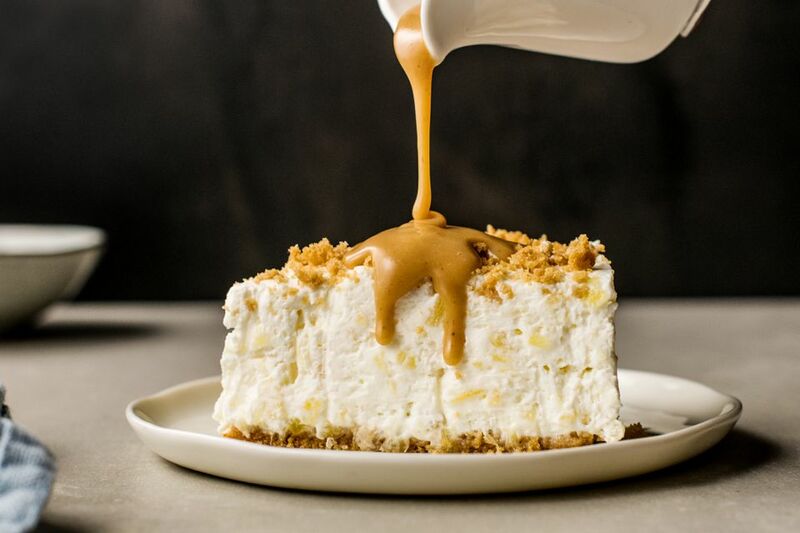 Creamy butterscotch sauce is excellent spooned over bread pudding, ice cream, and even apple pie. A chocolate sauce is always a crowd pleaser, and one that's made in just five minutes is even better for the cook. Maple vanilla sauce brings real maple syrup together with butter, vanilla, sugar, and cream to create a thick sauce to drizzle on almost any dessert. And if you're looking for something on the refreshing side, try a lemon dessert sauce, delicious over a pound cake or slices of gingerbread cake.